PAM DAOUST, aka Katharine Kincaid, is the author of twenty-two historical romance novels, four novellas and a children's book: THE HONU WHO KNEW TOO MUCH, A Fable For Grownups And Children. Her latest book, recently released, is THE STORY OF JACK, THE PIT BULL WHO BECAME A HERO. THE STORY OF JACK was inspired by rescued pit bulls owned and loved by her family. Once she got to know the breed, she grew to love it and wanted to tell "the other side of the story" about this often misunderstood and mis-characterized breed. Written under her pen name, Katharine Kincaid, her historical romances have been translated into multiple languages and sold around the world, including such far-flung locations as Russia and China. A longtime Ohio resident, she now calls Hawaii home and enjoys spending time with children, grandchildren and her first great grandchild. Horses (and dogs) have been a lifelong passion. Her first eBooks showcased her titles set around the history of different horse breeds. They are: PAINTED HORSE, RIDE THE WIND, RACE THE DAWN, WINDSONG and MASTER OF HORSES. She currently is owned and managed by a beautiful, much-spoiled Friesian horse who doesn't yet have his own book but is working on it. The Story of Jack: The Pit Bull Who Became a Hero is a contemporary fiction novel written by Pam Daoust. Jack was getting panicky the last few days he had been in the Animal Shelter. He was there with his mother after they had been found freezing to death out in the street by a little boy and his mother. They couldn't keep the two dogs, but rather than let them die in the cold, brought them to the Shelter. Jack was tiny then and still nursing, so the two were able to stay together until Jack was weaned. His mother had been abused by people, and she was terrified of even the nice ones and deemed unadoptable, so she took the trip Down the Hall that all the animals there dreaded. No one ever came back from Down the Hall, and the last view Jack had of his mom was her trying to get back to him. His own time at the Shelter was quickly running out. No matter how well he behaved or tried to interact with the people who came to find a pet, no one wanted him because they called him a pit bull and a dangerous breed -- that is, until Ally came to the shelter and took him home with her. Pam Daoust's contemporary fiction novel, The Story of Jack: The Pit Bull Who Became a Hero, is a heartwarming and inspirational tale that casts light on the plight of those dogs whose square or blocky faces cause them to be labelled as pit bulls or dangerous dogs. Daoust's Jack is a compelling narrator who shows the reader what it feels like from his point of view. Jack’s life is dedicated to the people he loves, and he finds the concept that he is somehow a bad dog because of his lineage to be quite incomprehensible. The author's story reminded me of recent news headlines where hero dogs have ended up in foster homes or worse due to city ordinances blocking their breeds. I was very impressed with The Story of Jack. It's a beautifully written story that addresses a very important social issue that everyone, whether or not they have an animal companion of their own, needs to be more informed about, and it does so beautifully. The Story of Jack: The Pit Bull Who Became a Hero is highly recommended. The Story of Jack: The Pit Bull Who Became a Hero by Pam Daoust is told to us from the dog's point of view. I have always been somewhat afraid of pit bulls, but Jack has made me re-think my fear and realize what a loving dog the breed can really be. The story opens with Jack’s birth in an alley and we follow him to an animal shelter, a loving life with Ally, losing Ally, living with Ned on the streets, losing Ned, being trained to fight in the pit, his escape, and his new friend Bridget. Jack, aka Dawg, and Brownie had a life filled with the factors that we are all forced to deal with during our lives. Jack faces both good and bad times; being hungry, hurt, lost, happy and loved. Jack freely shared all of his dog thoughts and emotions with me and I found myself wanting to reach out and pet him. I really enjoyed this book. Pam Daoust gave Jack a personality, a mind, and strong opinions on life in a way that was almost believable and very entertaining. The Story of Jack is unique and perfect for animal lovers and owners, young and old, male and female readers. After reading The Story of Jack, it is impossible not to look at pit bulls in a more positive way and it will make you want to run out and buy a puppy. The Story of Jack is a good read. 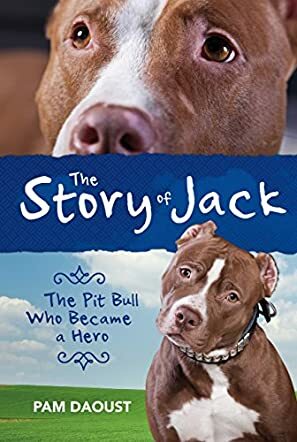 The Story of Jack: The Pit Bull Who Became a Hero by Pam Daoust is the amazing story of a pit bull born on the streets with little to no chance of having a life. Rescued from the shelter by his guardian angel Ally on his last day there, the unnamed puppy is finally given a name and a chance at life. While in the shelter, Jack had determined to be a good boy and, like any smart dog, he quickly learned everything Ally was teaching him. After tragedy strikes, poor Jack is renamed, has a new owner, and a bum leg. Life just keeps throwing curve balls at him when he finds himself taken by two men who throw him into dog fighting. Jack finds his chance to escape and he takes it, barely making it away from the fighting ring. Once again on the streets, Jack manages to survive and then a young girl named Bridget finds him and starts taking care of him. Jack then rescues Bridget and her babysitter from a fire and becomes hailed a hero and a twist of fate puts him back in Ally's care ... when another twist of fate gives him a real family to love with the two people who really cared for him. The Story of Jack: The Pit Bull Who Became a Hero by Pam Daoust is an amazingly written story seen from the first person point of view from Jack's eyes. The emotions that Jack conveys make it feel like Jack really did learn how to speak and tell his own story. The Story of Jack captures the intelligence, strength, resilience, and specialness of the pit bull breed. The author accurately and thoroughly captured what a dog goes through with a life like that. The imagery and descriptions put you right there with Jack. I felt his heartbreak and loneliness, his excitement, the hunger and pain, his hurt and anger, and the joy and excitement again when he was finally reunited with Ally. What makes The Story of Jack so special and unique is that it really puts you right there with Jack, and knowing that Jack's story isn't unique but is the story of many dogs out there. It's the story of puppies yet to be born and of dogs that have been gone for years. Jack's story is a real eye opener and it is my sincere hope that The Story of Jack: The Pit Bull Who Became a Hero wins awards and makes its way into the world. I feel that The Story of Jack could really help open society's eyes as to the fact that it's not the breed that's dangerous, it's the bad owners. This book is absolutely amazing! I will be telling my friends and family about it.